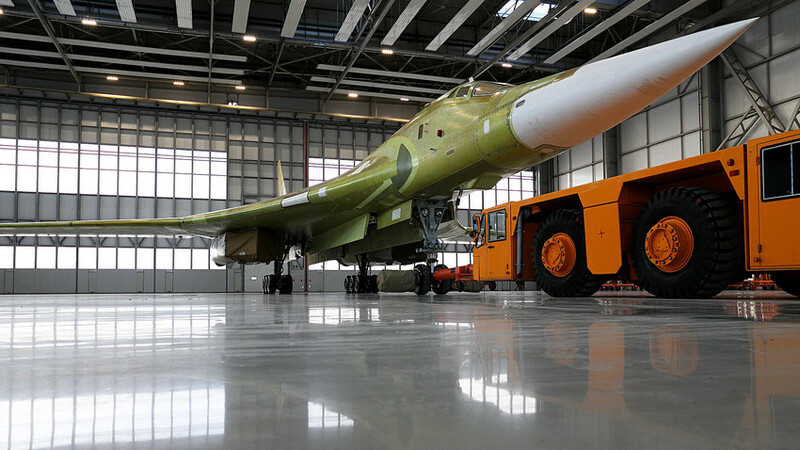 A prototype model of the Tu-160M2 aircraft is rolled out at the Gorbunov Kazan Aviation Plant, a subsidiary of PAO Tupolev. Following the maiden flight of the upgraded Tu-160 strategic bomber, Russian President Vladimir Putin suggested that a supersonic airliner should be developed using the same technology. In mid-January Russia's weapons manufacturers showed-off the upgraded Tu-160 strategic bomber to the country's president, Vladimir Putin. But the headline of the day wasn’t the maiden flight of the “White Swan” - as pilots call the aircraft - but Putin’s wish to develop a supersonic civilian plane based on Tu-160 tech. The head of the United Aircraft Corporation, Yuri Slyusar, says his company has already created a blueprint for such an aircraft and that aspects of the new bomber could be incorporated into the plans. The idea has left journalists asking: “What would the plane look like?” So far, the plans remain secret. The Tu-160 is the most powerful supersonic bomber and “missile platform” in the history of Russian military aviation. According to Putin, Russia will make ten Tu-160s costing about $267 million each in the near future. Military experts say the planes will be used not only in a deterrent role but also for the Defense Ministry's other day-to-day operations. "The term ‘missile platform’ highlights the bomber's capacity to carry both nuclear and non-nuclear cruise missiles, including new generation Kh-101 and Kh-555 long-range cruise missiles," TASS military analyst Viktor Litovkin told Russia Beyond. According to Litovkin, the aircraft will also be capable of carrying Kh-55SM cruise missiles with coordinates preset to hit targets at designated locations. "The Tu-160 can be equipped with any type of nuclear or conventional bombs: Armor-piercing, concrete-piercing and cluster bombs, naval mines, and so on. The combined weight of these warheads can be up to 40 tonnes," the expert added. Tu-160 can also carry up to 150 passengers but the public will have to wait at least a couple of years before the plane’s civilian prototype. During the Soviet period the country's aircraft fleet already had a similar supersonic airliner: The Tu-144. However, as Professor Vadim Kozyulin from the Academy of Military Sciences told Russia Beyond, this strategic bomber converted for the civilian market is completely unsuitable for carrying passengers. "The Tu-144 was very expensive to run: It needed special runways to be built and its servicing and fuel consumption cost the state a pretty penny. These expenses had to be compensated by the price of the ticket, which was on a par with the monthly salary of the average Soviet citizen," Kozyulin said. Only 10 to 15 of the new planes are expected to be made if the prototypes are successful - you’ll need to splash the cash as well if you want a ticket. "It’s Arab sheiks, heads of state, and executives of transnational companies in the fuel and energy sector - such as Gazprom and Tatneft - who will fly on this class of aircraft," Kozyulin added. Furthermore, it will take seven or eight years to develop an aircraft based on the Tu-160: "It’s the same as converting a tank into a tractor," he said. It is possible to use some elements of the Tu-160 to develop the new airliner - the fuselage or engines - but the interior of the aircraft will have to be completely different. "Military men are ascetic people. Missiles and bombs do not need comfortable conditions. It’s a different type of project, different money, different design etc. Strategic bombers are certainly the pinnacle of aviation construction and the height of the technological capacities of any state but they are completely uneconomical and unsuitable for the civilian market," the expert summed up. Did you know the Russian Navy has its own dinosaur? Where do nuclear submarines leave their “hearts”?